D) Other (and please explain.. e.g., floor plans, custom websites, etc.). Our company has been providing images from within the camera and using another camera to take a few exterior shots. I've been really selling the 3D Showcase as a HUGE bonus to what real estate agents already need for their listing (i.e., photos), and personally think it would be harder to sell the service without offering photos (even though they're time consuming). I'm excited for Showcase 2.0 and the real estate enhancements it will offer. We provide all of those options. For some realtors who are cheap and use to paying sub $100 for photos, we do them from the matterport plus a few hdr shots from outside. For others willing to spend a little more, we offer the works, from matterport, virtual tours, 2d/3d floor plans, higher quality photos done with multiple flash/umbrella setup, twilight photography and cinematic video including drones. I've found that you do need photographs or you will miss out on business. I've done maybe 10 jobs where it was matterport only. The rest of the time it's been something else, either floor plans or photos usually. To me, the best way is to offer photos and the matterport as an addition. Most realtors wont know about the product anyway, so you need to educate them. Trying to sell them a product they have no idea about is quite difficult. I also offer the first matterport for free. Give them a "nothing to lose" option. Either they will use the product or not. We also provide all the services that you list. We are new to the real estate market photography side so we are a little different then Jamie. We do a majority of models, because our agents are hard pressed to loose their regular photographer by going strictly with us. But we have filled in when their photographer is not available. We do whatever the client wants..... its a matter of what they need.. But we offer the 3D Tour, Photography, personal website and aerial video... Not often do people want all 3 but atleast the 3D tour and photographs. The MLS outside of San Francisco doesn't allow the 3D tours yet so you still have to have photographs. We offer a datashoot (capture), priced by square footage, or one with HDR photography. Our datashooter is a professional real estate photographer, and uses an HDR camera for the still photos, usually at the time of the datashoot. We usually don't use in-model screenshoots, but we do use images from the dollhouse view on our site and in our promotions; it seems a lot of folks offering Matterport services are using such, I think because a dollhouse image subtly suggests and reminds people they only way they can see this view is via what's in front of them: a true 3D model. So until drones can shoot color 3D Xrays, we Matterporteers have an edge. We too try to provide what the client needs (but we're not airborne yet), and have created a few web pages (on our site) for clients. We're finding it important to help our real estate clients understand how to use their showcase line and embed code. Whether the client is a DIY-type with their web presence or using a page provided by a large real estate company, seeing that an agent's showcase appears where he or she wants is as important as the quality of the model we create. I can see the advantage of a separate camera providing the listing images as the screenshots from the capture certainly are not high resolution... but there's definitely the added time to take those separate shots. For those that do separate photos, do you do it before or after the Matterport capture, or do it simultaneously (i.e., take photos of other rooms while the camera is scanning in another location)? I do it at the same time. You have around 30 seconds per scan to stand there waiting. I normally jump from room to room. I'll go take photos, do virtual tour panos while it's happening. My usual way is to start the matterport, and then do the floor plan measurements with the laser on the same level. It normally takes about 10 scans and i've finished the laser measurements. I'll then setup the camera and start doing that. Normally 1-2 scans per photo (depending on what it is - HDR or multiple strobe) If it's a feature area I spend more time. If its just a small bedroom/powder room, 1 shot is enough. Hey nice thread question. Yep, I offer all these services. I haven't really given out the MP showcase stills as they're not hi-res enough. I'm finding that the main thing my clients like are the 3D films that combine hand held film footage, 3D fly-throughs and even showcase screen captures (done with NVIDIA's ShadowPlay). I do run around shooting RAW stills, whilst filming and scanning so to be a fly on the wall would be kinda funny. Plans are often made too in the traditional architectural type look. These are a nice extra to offer but sometimes I don't have time on CAD to draw it, which makes MP's floor plan service look enticing MP Floorplan Beta. I haven't used we-get-around's 'floorme' service yet but I'm considering it next time plans are requested. Forgot to mention but 3D floor plans can be produced after it's been cleaned up for film. The more services you offer the better I guess, as long as the quality stays top notch! What I am finding on moderate to expensive listings are that agents are not looking for the better shots, they want extracted photos from the models. They are willing to pay less for lower quality photos and do not want to pay a little more for higher quality photos. But again at this time our agents are turning over their listings in 2-4 weeks and say they do not need to pay the additional expense. This may change when sales slow. But on our extreme high end properties we find since we are new to the real estate photography business, those agents use us for the model but use their regular photographer for a complete set of HDR or high quality shots. They will use us as a backup photographer if their photographer is not available on their timeline. I like your floor plan display idea, we normally extract the floor plan view and size it, label it and trace it in a CAD program. 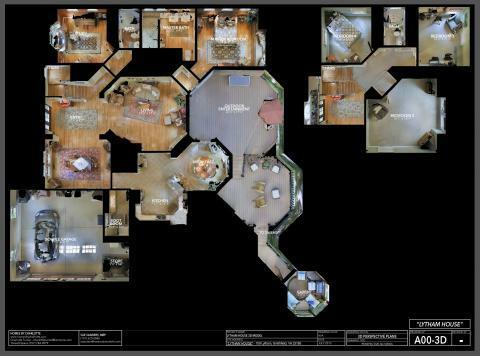 From an agent's perspective I would recommend offering C/D, agents want to package up their digital showing solutions with professional photography and possibly floor plan all in one. B just isn't feasible, and A would require them to hire a photographer separately. What do you charge them for that? @ron0987, I hear you. These are better for premium properties. I know I'm not a 'pro' real estate photographer so they'll get better results having someone else come in and shoot but sometimes you can offer hi-res shots and capture it decently saving everyone time. But yes, premium properties are sort of where we all are I guess? @Jamie, cheers mate. Indeed music is really hard to choose with this kind of work but whatever the client wants! These were $500.00AUD for the model patch, clean, fly, edit & film edit. Just a flat rate since there were a few to do but this can vary. It sort of depends on the job size and whether additional film editing from DSLR cameras are involved.